The routes into Camasunary and exploring the nearby peak of Sgurr na Stri are some of our favourite hill walking routes in this part of Skye. 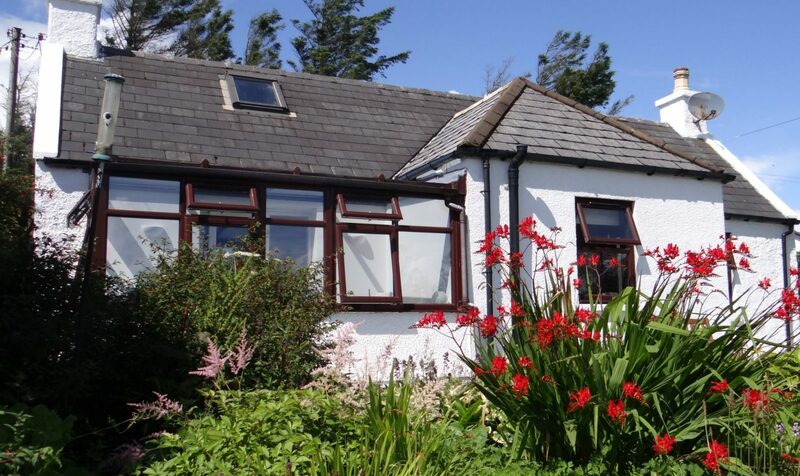 There’s plenty of wildlife interest, stunning views of the Cuillins and big horizon seascapes out to the west. But is it easy to get up a Cuillin? With tops of over 1,000m any peak on the main Cuillin Ridge is a serious undertaking and not for the faint hearted. You might want to try yourself out on Sgurr na Stri – a mini Cuillin topping out at a much more manageable 600m. You’ll get great views of the main ridge if it’s clear. Often the lower peaks are clear when the main ridge isn’t. From Elgol pick up the cliff path just over the hill behind Springbank, our self catering holiday cottage, and follow the coast to Glen Scaladal. Pick your way carefully along the narrow bits which can be slippy in places. The shore either side of the Glen are great for fossil hunting. Out of the Glen follow the path above the shore until to you reach the bay of Camasunary. An alternative route which misses out the cliff path starts from the car park on the Broadford to Elgol road at Strathaird. There’s a good track all the way up the hill and down into Camasunary. Sandy bay at Camasunary – that’s Sgurr na Stri ahead – no problem! The bay offers great bird watching opportunities with several species of diver seen here. The river is home to dipper and common sandpipers are regularly seen in summer. The glen behind Camasunary has greenshank and golden eagles frequent the tops and glens. Walk along the beach and past the old bothy. Here you will find the Camasunary river which has to be crossed at some point if you want to continue up the flanks of Sgurr na Stri. The river can be high and very difficult to cross, especially at high tide. It gets shallower further upstream but not much. Once across the river the direct route up the front of Sgurr na Stri is a scrambling route only for experienced scramblers. The walking route follows the stream that flows from the right hand side of hill as you look at it. Pick a line up onto the ridge in front of you and then turn left towards the summit from where there are brilliant views of the hills, nearby islands and down into Loch Coruisk. Loch Scavaig to the left and Loch Coruisk to the right – you’ll be in the heart of the Cuillins on the top of Sgurr na Stri. If you got up OK then there’s no reason why you shouldn’t drop down to Loch Coruisk. Check out our guide to the walk from Elgol to Loch Coruisk here. You’ll probably want a lift home after so pre-book your ride on either Misty Isle or Bella Jane. River too high to cross safely? If you don’t like the look of the river crossing then carry on along the bank and follow the river up to the loch. There’s usually plenty of water cascading over the rocks in this section and it is a great place to see dippers plunging into the water to feed. At the loch side enjoy the view up the glen towards Sligachan with Marsco on the right. Pick a line across the lower ground towards the slopes of Blaven and take up a good path until it links back up to the Strathaird track. If you came along the shore from Elgol then take the path from the loch towards the house on the beach and pick it up there. As always when going out onto the hills, plan your day and ensure that everyone in your party is properly equipped to deal with tough terrain. Check the weather forecast to ensure that the conditions are favourable for what you have planned. The walk is readily accessible direct from Springbank Cottage, our Skye self catering holiday cottage just nip out the back through the hill gate and over the small hill behind the house to pick up the coast path where the stream crosses it. There’s plenty of guide books and maps for guests to use at the house as part of our environmental activities offer. If you want more than just a “standard” holiday cottage, then take a closer look. We hope you will be surprised by how much is on offer during a stay at Springbank Cottage. This entry was posted in Hill walking, Skye and tagged Bird watching, Birds, Blaven, Broadford, Camasunary, Cuillins, Dipper, Divers, Elgol, Fossil hunting, Golden Eagles, Isle of Skye, Loch Coruisk, Marsco, Scrambling, Seascapes, self-catering holiday cottage, Skye, Sligachan, Spingbank Cottage, Strathaird, walking, Wildlife by Matt. Bookmark the permalink.